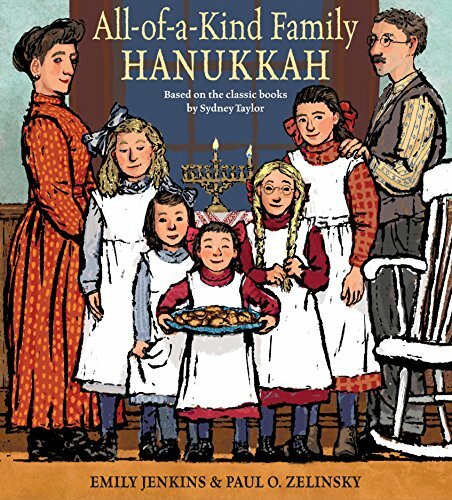 All-of-a-Kind Family Hanukkah is based on Sydney Taylor's original All-of-a-Kind Family books published between 1951 and 1978. It is primarily the tale of Gertie, a rambunctious four-year-old girl who comes from a large family of five girls and Mama and Papa. Set in the lower East Side of New York in 1912, the story begins with Gertie coming home to her family as they are busily preparing the meal for the first night of Hanukkah. And the best part of Hanukkah is the latkes, the crispy potato pancakes topped with applesauce or sour cream that are traditionally served on the eight nights of Hanukkah to "remember the oil that burned for eight days and eight nights in Jerusalem." As Gertie climbs up the stairs to her tenement building, she smells a chicken roasting, carrots ready to be boiled, and warm applesauce. In the kitchen, Ella, Henny, Sarah, and Charlotte are already at work with Mama. Gertie likes being in a family of all girls—"all of a kind," their parents like to say. But Gertie wants to help, too. Charlotte is peeling potatoes. But Gertie cannot because the peeler is too sharp. Sarah is grating the potatoes. But Gertie cannot help because the grater is even sharper than the peeler. Henny is chopping onions, but a knife is something Gertie is not old enough to use. "Mama has cracked eggs into a big china bowl, without Gerrtie's help. She sprinkles salt on top. She shakes in matzo meal. . . . and stirs it all together." Ella scoops up Gertie and says that she can help her fry the latkes, but Mama says the "grease could spit and burn her" so Ella is ordered to put Gertie down. Then comes the inevitable temper tantrum. "I don't want to go down!" shouts Gertie. "I want to help!" Gertie's boots "make a racket on the kitchen floor" as all her sisters and Mama watch in horror. Gertie is marched to her bedroom. Mama says she'll call her when it is time to say the blessings. Gertie hides under her bed. "It is cold on the floor. They will miss her when they can't find her. Mama will be sorry she didn't let Gertie help." Downstairs the cooking and preparations go on without her. The sound of songs being sung floats upstairs. When will Mama ever call for her? Papa saves the day when he goes up to Gertie's room and coaxes her out of bed with a gingersnap cookie and the promise that she can hold the shamash and help light the candle for the first night of Hanukkah. She's old enough to do that, thank goodness. Gertie even gets the first latke. Paul O. Zelinsky's illustrations are in a primarily brown and earth-toned palette and full of heavy lines that give life to the characters without being fussy. The expressions on the characters' faces are rendered in enough loving detail to allow their emotions to show without being treacly. The family members are each depicted individually so that despite the lack of detailing, each is individualized. As he says in a note from the illustrator in the back of the book: "It was largely about getting the feeling right. . . . Bolder outlines and simpler shapes, with almost no lighting or atmospherics, made the pictures ring truer—more like children's art, where the laws of perspective don't apply." All-of-a-Kind Family Hanukkah is a welcome addition to the library of books about the miracle of the eight days of Hanukkah. It celebrates family, food, and tradition in a way that will make you want to gather your loved ones together and sit down for a proper meal with all the trimmings.